Florida is not the only place for MLB teams to warm up before the regular season begins. For years, Arizona has been the perfect spring training setting and a host to fifteen MLB teams and their fans. As a popular spring training hotspot during February and March, the Phoenix area is home to The Cactus League and everybody eager to enjoy a cool atmosphere, great ballgames, balmy weather and scenic mountain ranges. All ten ballparks are in the Valley, most about an hour away or even less. 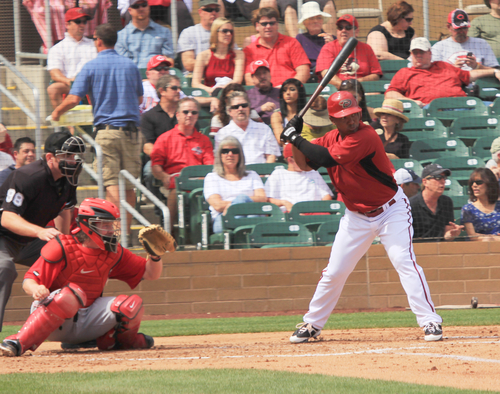 With your trusted spring training limousine service in Phoenix, AZ, you too will get to see all your favorite catchers and pitchers and have plenty of fun during spring training exhibition games! Just be sure to familiarize yourself with the ballparks, including their location, seating chart, and information about spring training tickets so you can book a trip to these destinations with great seats to watch the teams. In our last article, we’ve presented five Cactus League Stadiums. Let’s continue where we left off. Read on! As the first spring training ballpark built on Indian land, Salt River Fields at Talking Stick represents a joined effort of Arizona tribes and two MLB teams. Located in Central Scottsdale and opened in 2011, this stadium is the home of the Arizona Diamondbacks and the Colorado Rockies and it also hosts a team during Arizona Fall League baseball. Designed with a seating capacity of 7,000 in the main seating area and 4,000 seats on the sun-soaked outfield berm, the ballpark features the biggest scoreboard in the League, 3 party decks and 13 fields (including the main stadium). There are 3,000 parking spots and they are not free. A unique architecture and a fascinating view of every mountain in the Valley, as well as a myriad of food options, make Salt River Fields at Talking Stick a must-see stadium in Arizona. Keep that in mind when buying your spring training tickets! Opened in 1992 in the heart of downtown (or Old Town) Scottsdale to be the home of the San Francisco Giants, Scottsdale Stadium underwent its last renovation in 2006, when new deck and terrace seats were added in the berm area. The ballpark attracts large crowds for various reasons: urban setting, a range of available lawn seats and the proximity of seating to the baseball field, paired with free parking lots and scads of restaurants nearby. Best of all, autograph seekers have a truly unique access to Giants baseball players and the players agree to give an autograph more often than not. The game can also be your chance to make contact with your favorite players! Given that one of the most desirable spring training tickets are for the San Francisco Giants, if you don’t have a ticket, be sure to see if your game isn’t sold out before your limo service takes you there. Opened in 2014, Sloan Park is the newest addition to the Cactus League Stadiums. It is the spring training home of the Chicago Cubs, holding 15,000 fans – including 9,200 stadium seats and additional seats in patio areas and the outfield lawn. Here you can see several hints of Wrigley Field, such as the rooftop seats in the party area and the brickwork behind home plate, which is great for a photo backdrop. There are also plenty of shaded seats! Surprise Stadium houses both the Texas Rangers and Kansas City Royals and it is also the home of the Surprise Rafters during the Arizona Fall League. The ballpark was built in 2002 as part of the Surprise Recreation Campus. The first ballgames took place a year after. Parking is easy and free, the seating capacity is 10,500 and there are a lot of berm areas to choose from! Although there is a number of food options available at the stadium, fans are allowed to bring their own snacks (unless it’s take-out food from a restaurant) and one sealed bottled water. Wherever spring training tickets and seating you way choose, you don’t have to worry about missing anything – two big-screen TVs will make sure of that. Founded back in 1968, Tempe Diablo Stadium is one of the oldest ballparks in the Cactus League. It has been the home of the Los Angeles Angels since 1993. With the capacity to host nearly 10,000 fans, the stadium has a wide concourse and lots of restrooms and concession stands. Parking is not free and there is not much of it but if you hire a limo service, your chauffeur can get you there with the least amount of hassle. Bought your spring training tickets? Now it’s time for limousine rental in Phoenix, AZ! Want to visit some of the best ballparks in the country and enjoy the warm Arizona sun? There’s much more to Phoenix than spring training! Hire #1 limo service in Phoenix, AZ, and AZLIMO.COM can take care of your transportation, leaving you more time to enjoy your stay in the Valley! We are your premier limo service that can meet all your luxury transportation needs. Get ready for your newest spring training experience and Arizona adventure! Call us or book our services online – today. Wherever you want to go, we’ll take you there!